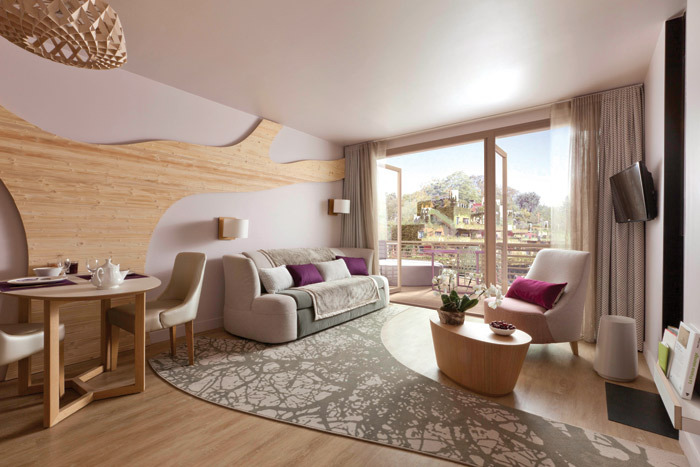 Les Villages Nature is set to be a new flagship project within France’s sustainable tourism sector. Supported by Bioregional, using its One Planet Living framework throughout the decade-long realisation process, the project has seen Bioregional’s clear principles and goals applied with the aim to construct better and more sustainable places to live, work and do business. It has a global vision to create a world where everyone lives happy, healthy and sustainable lives. With its One Planet Living framework it hopes to make the delivery of sustainable approaches to living achievable. Les Villages Nature ‘aims to lead the way in reconciling large-scale tourism with the pressing need for sustainable development’, it says. Having successfully applied these principles already to several global projects, it became involved with Groupe Pierre & Vacances-Center Parcs and Euro Disney SCA’s joint venture, Les Villages Nature, in 2005. The design for Les Villages Nature creates a resort set amid lakes, woodland, meadows and gardens and all in a car-free environment. The One Planet Living framework highlights the problematic way in which Europeans live, stating that if all the world lived like the West, we would be using three planets’ worth of resources. The framework outlines what is necessary to develop projects within the resources of a single planet. 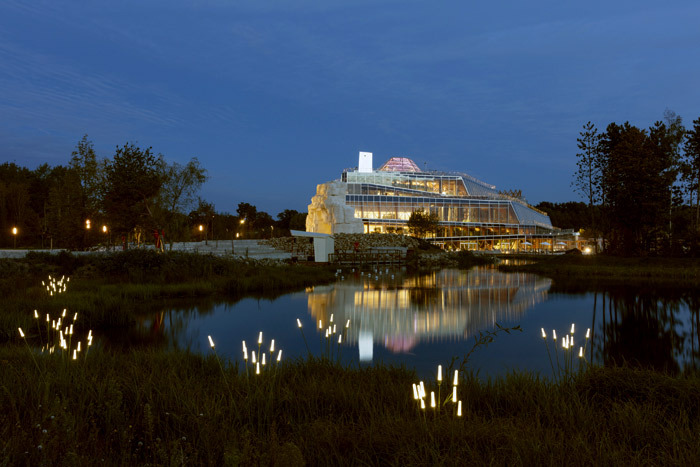 Les Villages Nature’s ambitious vision was made possible by landscape architect, Thierry Huau. Paired with Walt Disney Imagineering, Huau took on the creative direction to produce a sustainable holiday destination that does not compromise on the fun, whimsy and playfulness that both Disney and Center Parcs are known for. Described as a ‘plant city’, Huau envisaged Les Villages Nature as somewhere to break down barriers between indoors and outdoors and reestablish connections to nature. The design had to be sustainable but also had to introduce visitors to the possibilities afforded by living immersed in nature. His ‘extraordinary gardens’ are a vehicle for this. The gardens focus on the four main elements: earth, fire, air and water. Through his design, Huau wanted to create something ‘to pass on messages ranging from biological control to geothermics, from insects to climate issues, from the fragility of ecosystems to “do-all” plants’, he says. Les Villages Nature marries the need for sustainable tourism with the existing, longstanding demand for whimsical holiday resorts founded in adventure, discovery and family bonding. The buildings themselves are made with carbon-storing timber, from certified, managed European forests and only use low-carbon concrete. A mile underneath the complex is a geothermal heat source. This carbon-free resource provides heating and hot water to the entire complex, including numerous swimming pools . 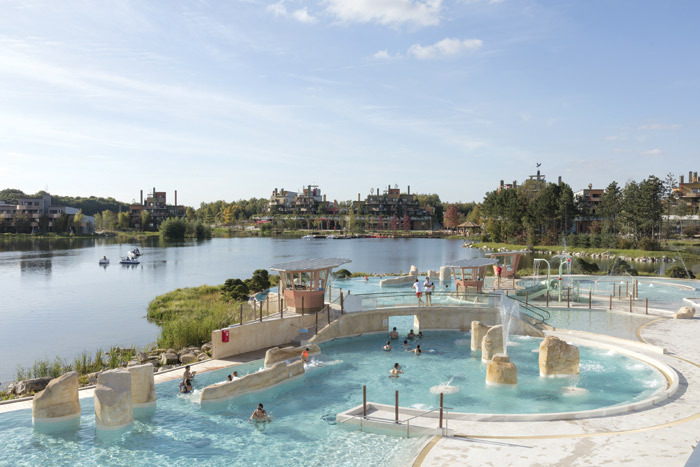 At the heart of the park is the Aqualagon – an enormous indoor-outdoor swimming centre and water park – made of the same low-carbon concrete and totally immersed in nature, much like the rest of the park. Designed by architect Jacques Ferrier, Aqualagon is the largest aquatic centre in Europe. The glass and steel structure supports green roof terraces that visitors can ascend to the peak of the pyramidal apex. The transparency of the building puts nature on show at every point, ensuring the spectator sees both water and greenery from the inside out, all year round. Reaching beyond ecological sustainability, Les Villages Nature also sustains the local economy through the creation of 600 jobs locally and a further 1,600 in the surrounding area. 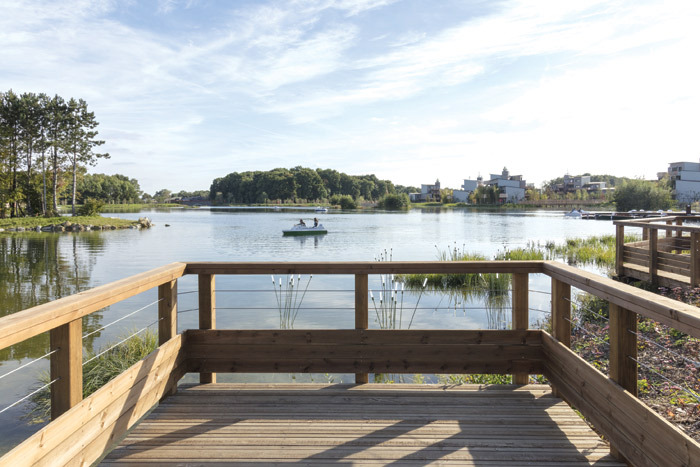 ‘The One Planet Living framework has helped us consider not only environmental performance but also all the economic and social benefits Villages Nature Paris can bring to local communities and its stakeholders,’ explains Marie Balmain, head of sustainable development at Pierre et Vacances-Centre Parcs Group. With strong train and bus connections to the rest of the country the resort aims to provide holidays that eliminate the need for plane and car travel. A car-free resort minimises the need for road space and, more importantly, parking space. Freeing up the acres of land that a resort this size would require for parking affords numerous opportunities in place of the eyesore that can be car parks. ‘This large-scale project gives the opportunity to bring city and nature back together’ says Huau. Les Villages Nature offers a new kind of tourism. Many may assume that to create a holiday resort that has little to no impact on the environment is not possible. The presumption may be that to be truly sustainable we should forgo holidays; they are a luxury and luxury assumes a cost, economically and to the environment. Les Villages Nature subverts this assumption and offers guests a responsible form of tourism that doesn’t compromise on experience and has proved just how achievable the One Planet Living framework in the tourism sector can be.